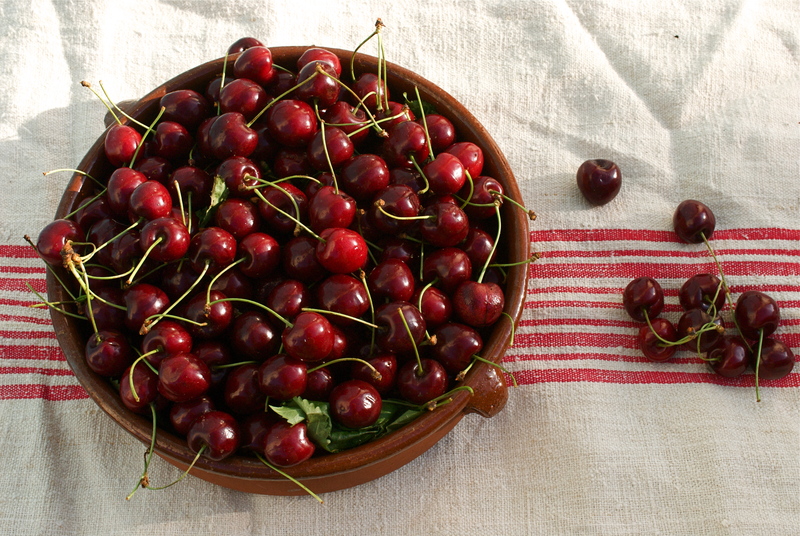 I had my cherry mountain last week and, as always seems to be the case with any glut, very little time to cook them. We were off to spend the weekend camping at WOMAD so my recipe had to be both fast and transportable. What could be better than a batch of muffins? 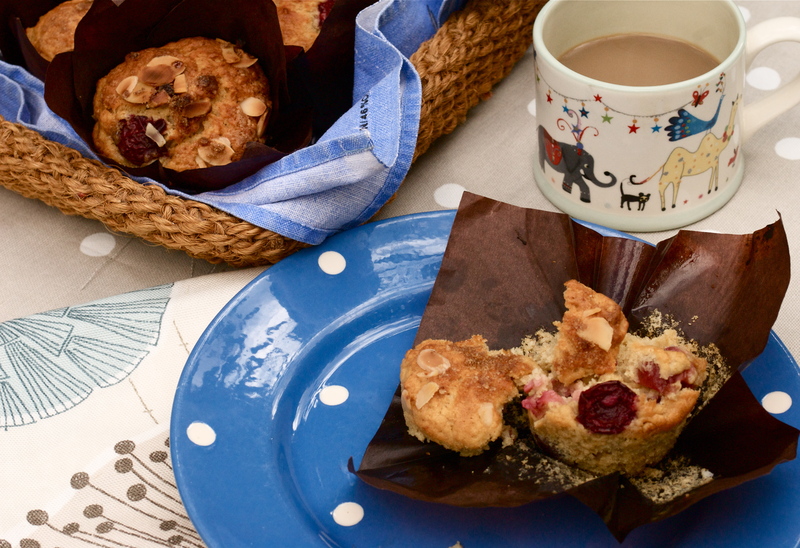 Caramelising the butter for these muffins really is the cherry on the cake. In fact browned butter, or beurre noisette as it’s known in France, is one of the simplest and most delicious things that you can whip up in the kitchen. So good in fact that I’m going to give you a fool-proof, step by step recipe. Take a knob, or your desired weight, of unsalted butter and place it in a stainless steel pan. I like to be able to see the colour of the butter and a dark non-stick lining makes this impossible. Now heat up the butter. The white milk solids that separate away from the fat will eventually caramelise and turn a deep bronze, giving the butter the most extraordinarily nutty flavour. It’s all in the timing rather like a sugar caramel, and once you get cooking it’s time to tell the PPI-claims-caller where to go. You need to watch and sniff, no stirring required. As it cooks, the large uneven bubbles on top of the butter will eventually transform into a Cappuccino-like foam. The hazel-nutty smell will waft from the pan and if you swirl it you’ll see tiny golden particles. Allow the specks to turn a really good, foxy-brick brown before tipping the butter into a cold jug or bowl. Pale gold and the butter will be cloying rather than nutty, too dark and it will taste burnt. It’s not tricky at all but you do need to be on the case. Add some capers, plenty of roughly chopped parsley and a good grind of black pepper. Eat with grilled, baked or fried white fish or seared scallops. Throw in a few fresh sage leaves (about 5 to every 100 g of butter) when you begin heating up the butter. They will crisp beautifully as the butter caramelises. Serve with spaghetti, plenty of parmesan and black pepper. This makes a great sauce for spinach and ricotta, or pumpkin, ravioli. Add to any baking recipes that call for melted butter for an extra dimension of flavour. This really is a throw-together recipe. You can of course replace the cherries with other fruit, use vanilla rather than almond extract, exchange or leave out the nuts and even use white sugar rather than the Muscovado if it’s going to save a trip to the shops. Make your caramelised butter and allow to cool whilst you get everything else ready. Toast the flaked almonds in a frying pan, or in the pre-heated but watch them like a hawk. Now sift the flour, baking powder and salt together and then stir in the almond extract, 3/4 of the sugar, the egg, milk and butter. Bring the mixture together but don’t over stir or you’ll end up with rubbery muffins. Fold in most of the cherries and spoon the mixture into papers, a greased muffin tin or a silicone mould. Top with the remaining cherries and sprinkle with the last bit of sugar. Bake for about 20 minutes, or until golden brown and an inserted skewer can be pulled out clean. Allow to cool on a rack and devour as soon as possible.